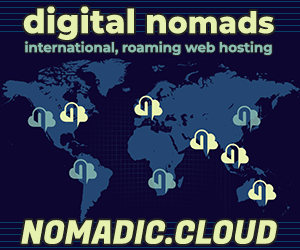 South Korea is one of the best possible countries to visit, work from, and travel around, for the digital nomad. Countless cafes, and wifi that is the fastest in the world. The beauty of its national parks, stunning beaches and incomparably kind people. South Korea is a treat from where to balance work and exploration. I am towards the end of three months in South Korea, visiting a new connection I made at the Scandinavian Burning Man event, Borderland. Together, we visited a couple of national parks, and spent two incredible weeks on magical Jeju Island, before making our way back through the mainland to Seoul. We’ve enjoyed non-stop surprises. 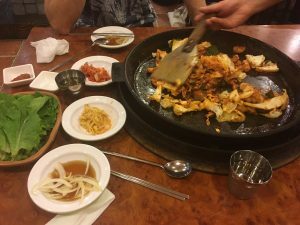 While at first the culture shock of minimal English, a confusing local alphabet, a devotion to seemingly strange food everywhere, and wonder at Korean obsession with coffee shops and K-Pop, as the visit wore on I warmed up to the Korean life. The ability to free camp in many places adds to the appeal, and helped my minimal budget during my stay. You can easily live on around $15 a day here, if you camp or have somewhere to stay. Public transportation is systematically excellent, and Seoul might have the best public transport in the world. It’s among the top I’ve ever come across. Koreans are readily affluent. There is a lot of disposable income, with all the $5-8 coffees, brand label fashion, and luxury cars. Not a lot of homeless people seen – and even then, that was after dark. (Update: With the onset of sub-zero temperatures, I’ve seen hordes of homeless take to the underground Metro shelters). The country suffers from an aging population, with remnants and survivors from recent regional wars. The contrast between elderly traditional Koreans and the sophisticated younger generation is quite interesting. The country and its society is one of respect, of manners. Even the language is quite logical, when you learn the alphabet. Korean character is a combination of letters that make up the syllable in the word. This helps you pronounce and read Korean words quite rapidly. With these attributes, and an absolutely sensational time living the dream in my personal lfe, South Korea has quickly become one of my favourite places on the planet. There are more coffee shops in Korea than I’ve seen anywhere else in the world. So many, that listing them is pointless – you can barely stumble a block or two without finding at least one. 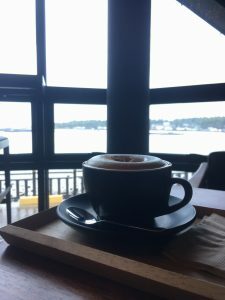 I’m writing this part from the southern metropolis of Busan, the country’s second largest city, and Seongjyeong Beach features three coffee shops in the very same building. I’m in Compose Coffee, on a road with mega coffee shops – 4-5 story modern buildings. Patios of coffee after coffee after coffee. Toast is bizarrely popular in Busan, with lines for one pop up cafe, Moon, wrapping around the block for hours. The wonders of bread never cease to amaze – or ppang, as it is called in Korean. Coffee is of consistent quality, and consistently expensive – approximately W5,000-6,000+ won each. You can find coffee in smaller cafes and street vendors closer to W2,000. I regularly compare cappuccinos around the world to my spoiled Melbourne roots, and I enjoyed a few coffees at Melbourne levels. Most admittedly fall a little bit short. With coffee, comes cafes, and there are very many. Typical in Korea, the wifi is top notch, and staff leave you alone to conduct your work. Many are open 24 hours. There are, additionally, more boutique, location-specific cafes, and smaller shops, many takeaway locations if you prefer a cheaper alternative to take a coffee to work no a wifi-enabled park bench or gazebo. Yes, there is also the occasional Starbucks. Oddly, South Korean cafes are unlike their Western counterparts in that there is rarely food, beyond desserts and ice cream. We did not find delicious breakfasts, Eggs Benedicts, or similar anywhere, and rarely a sandwich. You may find waffles with ice cream. We were so inspired by the South Korea coffee craze that we set up a domain and website – southkorea.coffee. As with everywhere in South Korea, all the places we stayed feature excellent wifi. 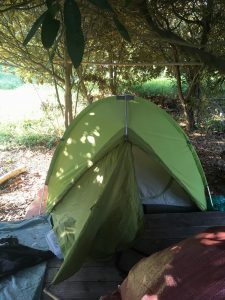 We spent more than half our nights together sleeping in my tent, all over a camping-friendly country, with a night or two each week in a budget hotel or hostel, and the occasional surprise of a night in a new friend’s house. 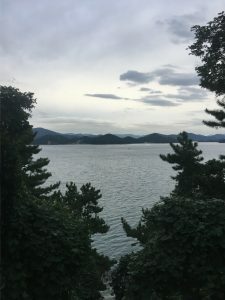 One lovely Korean family even put us up in a guesthouse in the sensational seaside city of Tongyeong, during a week with literally 100% of properties full! You can consistently find bunk beds in hostels from around W10,000 (roughly $10), and good budget hotel options from W25,000-30,000 per night. Serious hotels start in the W100,000 per night range, with some good value to be found. Hotel9 Dongdaemun – Super modern, we paid W25,000 won p/n for a deluxe double room with perhaps the most comfortable bed I have slept on. It’s a little further from the city centre and my friend than I’d like. Heart Motel, Uijeongbu – We couldn’t camp in Bukhansan National Park, so I found a last minute hotel deal nearby, Vegas-style. I actually passed out from too much soju, but my friend remembers the night as being a lot of fun! The room featured a hot tub spa, that I was unfortunately unable to enjoy. 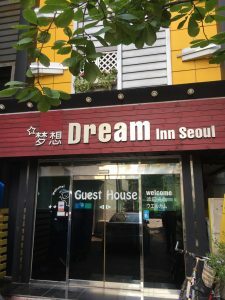 Dream Inn, Seoul – Incredibly chill, friendly, cute. The sweetest owners. A cozy rooftop to work, and kitchens on each floor for your food. Dustin’s Guesthouse, Hongdae – My top pick in Seoul, it’s a cool vibe, interesting guests, and in the very middle of the vibrant Hongdae action. Hotel Charis, Incheon – This is a legit 3 star hotel, that should be 4 stars. We were shockingly upgraded to this due to a booking.com cancellation, with the difference refunded. Normal price is W130,000 per night. With the fabulous breakfast buffet, suffice to say, we had a blast here! Bunker Motel, Incheon – SUPER comfortable, value hotel. 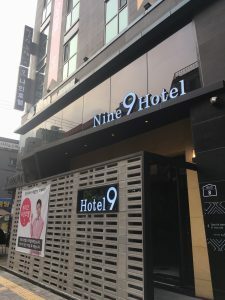 K-1 Motel, Incheon – Great value for dollar. Spacious double bed and free juice, coffee, toast.. and noodles! House Guesthouse, Sokcho – Drenched in pouring, freezing rain in early November, we had no chance of camping, but we randomly stumbled upon this exceptional guesthouse. The owner let us share a single room for the night, bailing us out at 11:30pm for a very good price. Kimchee Downtown Seoul – I found this large hostel a little cold and sterile. If you do have the coin to spend, you’ll find excellent value on hotels and resorts across the country. We enjoyed a couple of excellent experiences on Couchsurfing as well – each with interesting, generous hosts. 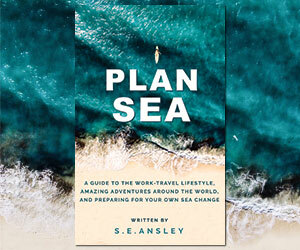 This is a special section for digital nomads who travel with a tent, and for camping & hiking enthusiasts. Camping is legit in South Korea. 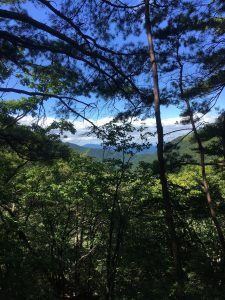 Despite our initial struggles with miscommunication about permission to camp in Bukhansan National Park (note: it is forbidden, whatever other Internet articles might say), and some shyness about camping in the heart Chiaksan National Park (with us booking a camping site instead – with the second night free! ), Jeju Island brought us into the camping mindset. Basically, find a beach, and set up your tent as if you’re there for the day or the evening. This is a common practice – to set up a tent, make some food, take a break from the sun. Then, simply keep your tent up, wander off to explore the area, and spend the night. There is no law prohibiting camping in South Korea, other than, perhaps, if you encroach on private property. Locals will not disturb you. You can also find lots of spots in quieter parks, in between trees, or near picnic areas. Note that this might not work so well in the bigger urban cities where there is a lot of lighting and CCTV, but this was no problem on Jeju Island. A couple of times, we like to venture off the beaten path, to spots tourists would never find, with perhaps only occasional visits by locals. One spot was beyond a river, under a humble gazebo near underwater caves, a beach of boulders, and only the ocean in front of us. Morning after morning we would wake in some of the planet’s most stunning scenic locales. 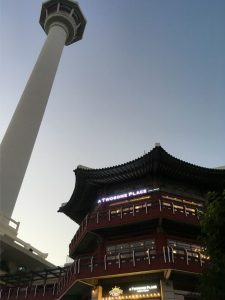 One day we woke up at the Yeosu Expo – a huge national attraction and amusement park! Yeosu Expo, past the aquatic centre, near the bridge. More out of fatigue and necessity – departing before the gates opened to the public. 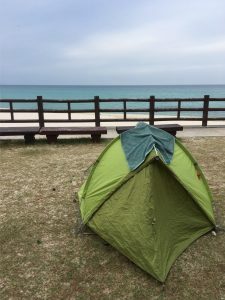 Songjeong Beach, Busan – There is a paid camping area with showers and a kitchen, or really just camp for free anywhere on the beach – we chose the far East end, near the park. 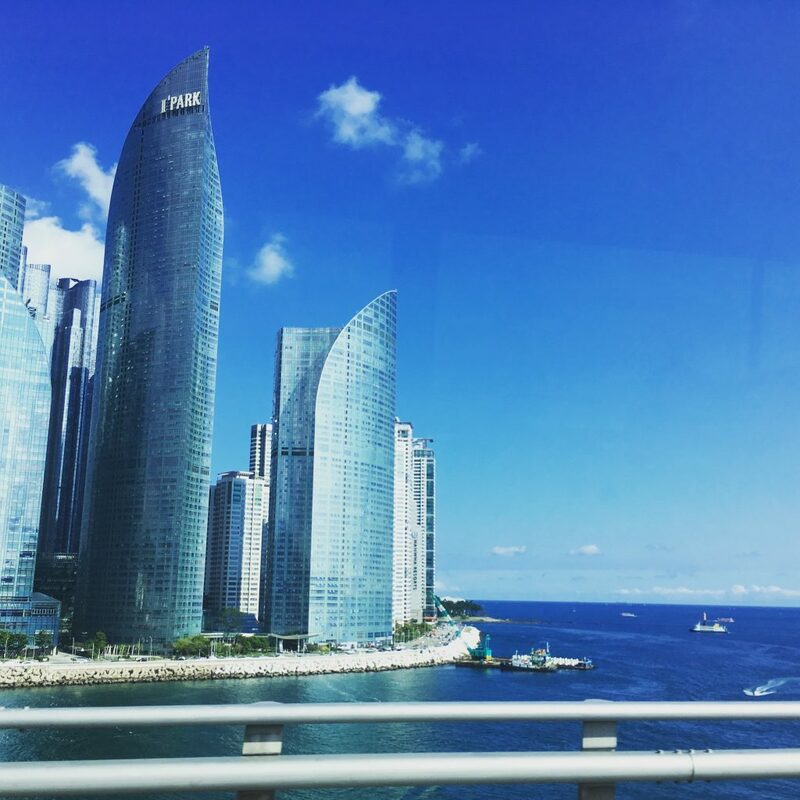 Songdo Beach, Busan – A smaller beach but a lot more local restaurants. There is a new pay-for “glamping” campsite here, but we set up our tent at the back of the centre of the beach. Sokcho Beach, Sokcho – Freezing, torrential rain spoiled our plans, but we were otherwise heading here. There are a few beaches around Sokcho you can try. We even slept a night on the streets in Seoul, as a miniature social experiment. Not with our tent, but finding a secluded area. If you’re desperate enough for shelter, the homeless are provided with sleeping mats and a pillar in Metro stations. If you want to stay in any of South Korea’s 22 national parks, you’re in luck – they have wifi too! Just note that many do not permit camping, and, those that do, ask for a fee. The Internet is extremely unreliable about camping information in South Korea, as a warning. Perhaps even more popular than coffee shops in Korea, are the restaurants, which are everywhere. 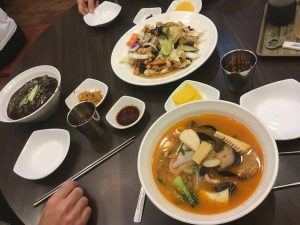 While you can find just about any type of cuisine in South Korea, Koreans are particularly proud of their local dishes. There are restaurants that grill your choice of meat and/or vegetables on hot plates in the middle of your table. There are other places where you sit on the floor to share noodles. Korean restaurants come with a heap of side dishes, that you can generally ask for refills when the plate empties. Chicken is extremely popular, and everywhere – fried, grilled, baked. There are burgers, pizzas, Japanese & Chinese food. Street food in larger cities will set you back between W500 and W2,000. There is an abundance of seafood, with pork and chicken the next most popular food items. It’s perhaps not the ultimate haven for vegetarians, unless you can be careful to order strictly vegetable-only dishes. You can find bowls of noodles as cheap as W4,000 ($4), a whole chicken from W6,000 to W8,000 (though many places are around W17,000), and sit down, table-cooked food at W10,000-20,000 per dish. Seafood is vastly more expensive. For travelers on a budget, you’ll glow at the quality and quantity of convenience stores. They are as prevalent as coffee shops. GS25, CVS, 7/11 and more are in every town, city and block. Buy a cup of noodles, burger, or other food, and use their complimentary microwave and hot water, while enjoying your meal in comfortable, cafe-style confines. Also, usually, with wifi! With noodles around the W1,000 ($1) mark, and tasty burgers around W2,200, you can sculpt affordable meals, and save for the occasional splurge at a quality restaurant. I fulfill most of my work during my trip at various cafes across the country, occasionally checking in from my smartphone on wifi-enabled buses or on the streets of the country’s cities. South Korea is an understated gem in the world, unnecessarily tarnished by its geographical position among the world’s superpowers. Glossed over due to the over-emphasized threat of its neighbour to the North. South Koreans don’t seem too concerned about nuclear war – they are among the happiest people I’ve come across. 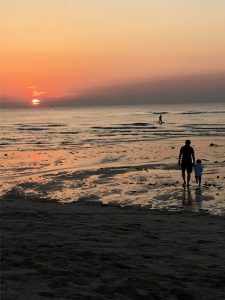 It’s a safe, clean, intelligent nation, and, with its beautiful attractions and top notch infrastructure, makes South Korea an ideal place to visit, work and live the dream for digital nomads.